With the great lakes mostly frozen (91% coverage as of March 5, 2014); Guelph Rivers continue to delight Birders with rare birds (for area and time of year) that are visiting us for open water. The last time the great lakes had extensive ice coverage to this degree was 1979, in which 95% of the lakes were covered by ice and snow. To date, this is the second highest ice coverage on record with the potential for a new record if cold weather persists. For more information on the potential record-setting ice coverage, there is a good light read from the Windsor Star published on March 6, 2014. A continuing bird (reported for at least a couple of weeks now), this handsome diving duck, the “Redhead” (Aythya americana) has been a constant on the Speed River just east of the Hanlon Bridge. 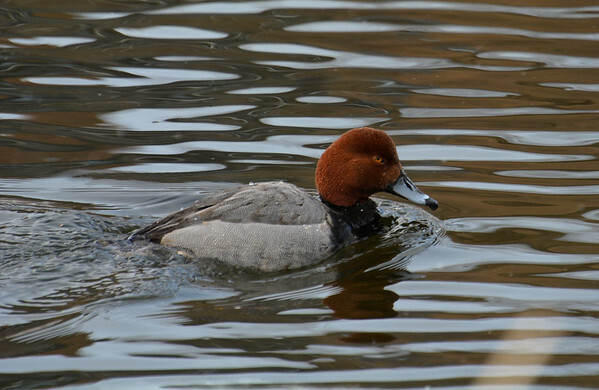 The Redhead is a medium-sized diving duck which sports an aptly named chestnut “red head” and a distiguishable blue bill with black tip. This Redhead male has been consistently reported in eBird submissions, accompanied by 3 Lesser Scaup (1 male, 2 female) and a Bufflehead male; amongst the entourage of Canadian Geese, Mallards, and Common Goldeneyes.